Alice Haekyo Lee, our October soloist, recently made time in her busy New York schedule to answer a few questions we sent her. Alice, of course, won our hearts at the Don Chrysler Concerto Competition last spring, with her wonderful performance of the Saint-Saens violin concerto. The Juilliard Pre-College Division is a program for students of elementary through high school age who exhibit the talent, potential, and accomplishment to pursue a career in music. The curriculum includes weekly lessons in the major field, chamber music, and classes in music theory and ear training. Additional electives are offered in areas such as composition, music history, conducting, and other specialized topics. Students are given ample opportunities in solo, chamber, and orchestral concerts. High Notes: How are you liking New York? How do you live, have you rented an apartment? Alice: New York is really really really really really really awesome!!! And although my mom doesn’t like it as much as I do because New York is really crowded, I love it. I really like tall modern buildings and lots of lights and technology and colors and people and shops. The only bad thing to me is that New York is really smelly, especially in the morning because all the garbage is put out in front of the restaurants. But even though New York is so awesome, I still miss Victoria a lot! We have rented an apartment right across from Manhattan in New Jersey, and although we haven’t moved into it yet, we have been in it, and the view is fantastic because our windows face the city. H.N. Do you have siblings, and are they with you there? Alice: I have an older brother who is 11 years older than me. He’s in San Francisco right now. H.N. Which school did you attend in Victoria? 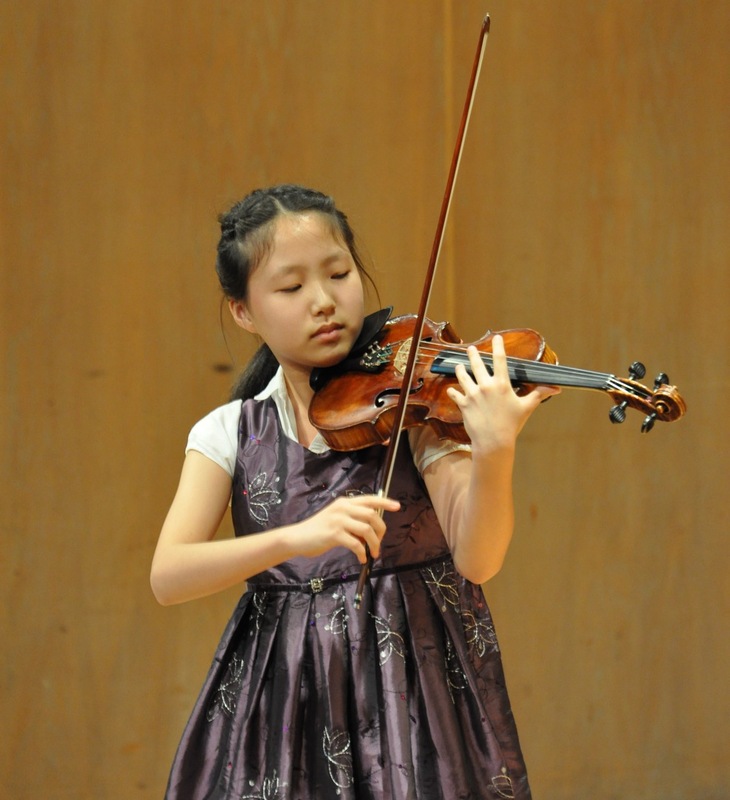 Alice: I used to go to St. Michaels University School, and then I switched to home schooling for middle school, so I have a lot of time for practicing violin. H.N. Tell us about Julliard. Alice: Juilliard is awesome as awesome can get. The outside of the building is made out of glass and is very modern looking while the inside is more worn down. Almost every hallway has students walking up and down searching for their classroom or talking with their friends or standing against the walls waiting for their classes. The thing I like most about Juilliard is that everyone has the same kind of passion that I have and I feel more like a normal person, when at school (or anywhere) I felt a bit lonely because everyone was talking about the latest pop star or video game and I wouldn’t have any idea what they were talking about. Even though after I have finished my classes on Saturday (pre-college is only on Saturday) and I think I’m going to drop from exhaustion, I really like Juilliard, just like the way I really like New York. H.N. Are there other students your age? Alice: There are a lot of students who are my age (which is 12) and all of them are really good. I’m really looking forward in working with the orchestra!!!!! I will be returning to Victoria on October 22nd to rehearse for the concert.